We've known about some undesirable features of Google+ commenting, for a while now. No ability to moderate comments, made against your blog, before they are published. No ability to moderate comments, from the dashboard. No controls for moderation, or for notification, of comments. No ability to view all comments, made against your blog. No ability to block all undesirable comments, made by people who don't like your blog. These are just a few details, which directly affect commenting. Not every blog owner realises that anybody in Google+, able to view their blog, can make comments about their blog. Unfortunately, just as you can't see the posts made in Google+, by people not in your circles, neither can you see comments made by people not in your circles - even if their comments are published against your blog. Deciding that Google+ comments may not be their cup of tea, some blog owners decide to revert to Blogger native commenting, and recover normal commenting features. 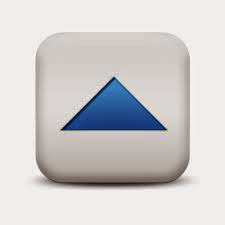 Reverting the blog, to use Blogger based comments, is simple enough - in most cases. On the Blogger dashboard Settings - "Posts, comments and sharing" page, look for the option "Use Google+ Comments on this blog". Selecting "No", then "Save settings", your blog is back to native Blogger comments. Go to the dashboard Settings - "Posts, comments and sharing" page. 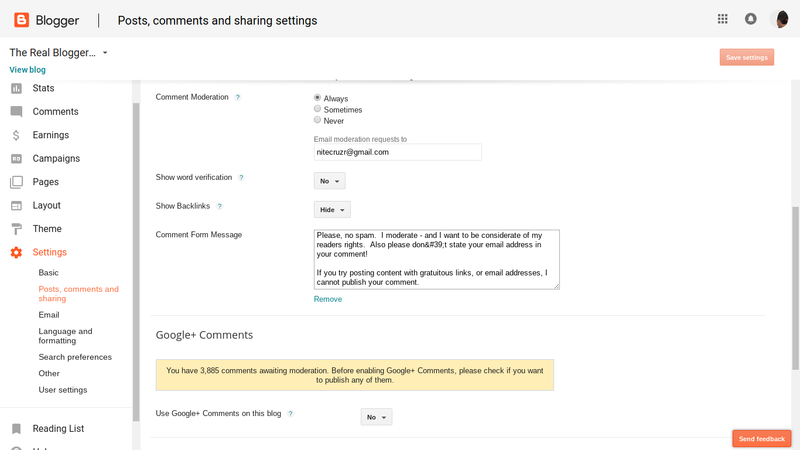 Select "No", for "Use Google+ Comments on this blog", then "Save settings" - and your blog will be using Blogger comments. To verify success, you may need to clear browser cache, and restart the browser, before checking the blog again. Some blog owners think that deleting their Google+ profile, or simply reverting their Blogger account, will immediately recover control of commenting. Having deleted / reverted the Google+ profile, however, the dashboard Google+ page disappears - but the blog continues with Google+ based comments, and with no dashboard selection to "Use Google+ Comments on this blog". For any blog owned by a Blogger account with a newly deleted (reverted) Google+ profile, the blog owner must reverse the deletion, to remove Google+ Comments. Upgrade the Blogger / Google profile to Google+. Create a new Google+ profile. 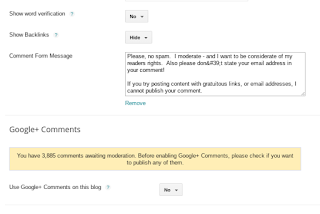 Select "No", for "Use Google+ Comments on this blog". If you decide that Google+ based comments don't suit your Blogger blog, you can recover normal Blogger comments - but please recover carefully. 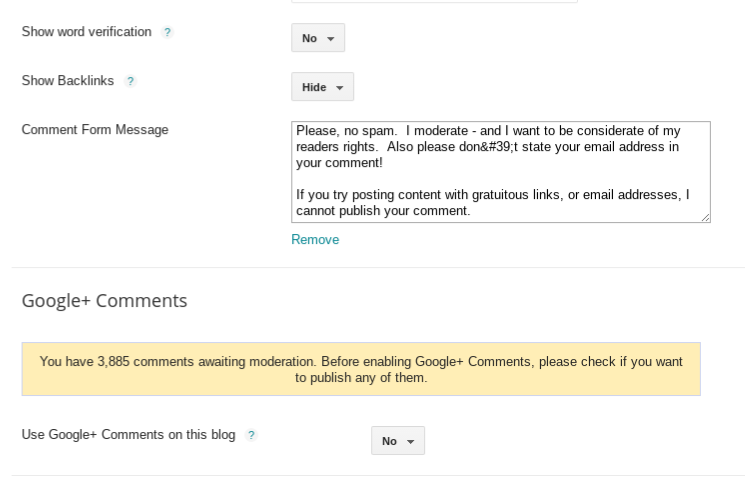 Always change the dashboard option to "Use Google+ Comments on this blog", before doing anything else. 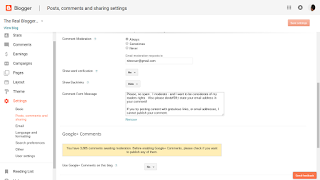 And remember, Blogger blogs will display either Blogger hosted comments, or Google+ hosted comments. If you have interesting Google+ comments, and you revert the blog to Blogger comments, you're going to lose any existing Google+ comments. So choose your comments host - but choose wisely. Thanks, I do not like that feature and have been trying to change it back. maybe it will change in the future, I'm sure you'll keep us updated :). Thanks...It has been a great help..